Nias is an Indonesian archipelago located on the western of Sumatra, with an area of approximately 5.625 km. Nias island has a rich of natural resources such as copra, rubber, cocoa, fish, coal and even oil was stored in the earth’s Nias. 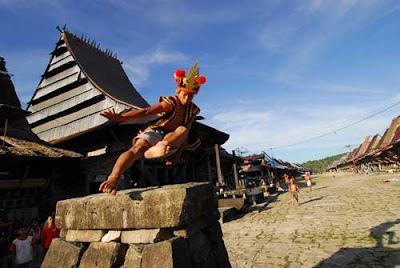 Nias Island has a unique cultural attraction that is very different from other cultures in Indonesia. Nias Island is located at 1°6?N 97°32?E? / ?1.1°N 97.533°E? / 1.1; 97.533, covering an area of 5,121.3 km² (including minor offshore islands) which is mostly a lowland area on average 800 m above sea level. There were 756,762 inhabitants on the island (including minor off shire islands) at the 2010 Census. It is located in a chain of islands parallel to the west coast of Sumatra; Simeulue is located about 140 km northwest, and the Batu Islands are located about 80 km southeast. This chain, which resurfaces in Nusa Tenggara in the mountainous islands of Sumba and Timor, is the forearc of the South Sumatra Basin along the Sunda Trench subduction zone. At Nias the oceanic plate is being obliquely subducted under the Asian Plate at the rapid rate of 52 mm a year (Milsom). Nias is the largest of the islands off Sumatra that are part of North Sumatra province. This area consists of 131 islands and Nias Island is the biggest. The population in this area is about 639,675 people (including Ono Niha – the native inhabitant of the Island, Malay, Batak, and Chinese). Until 2003 Nias was an administrative regency (kabupaten), part of the province of North Sumatra. In 2003 it was split into two regencies, Nias and Nias Selatan (Southern Nias). Subsequently the island was divided further, with the creation of two further regencies from parts of the former Niass Regency – Nias Barat (West Nias) and Nias Utara (North Nias) – and the designation of Gunungsitoli as an autonomous city independent of the four regencies. Gunungsitoli remains the capital city of Nias regency and it is the center of administration and business affairs of the Nias regency. Teluk Dalam is the capital of Nias Selatan. Nias has manifested tradition still strong in the form of social relations, geographical environment, cultural artifacts that became a process that is intact. If you visit these islands then you will find a megalith sites and artifacts, traditional villages, rich language, crafts and traditional architecture. Many tourists know this island because it has beautiful beaches and good waves for surfing. Usually, tourists destinations on Nias is Sorake beach located in South Nias district. But other than beach Sorake, there is a beautiful surfing spot in South Nias Island called Sibaranun Island. On this island there is only one village called Village Sibaranun and this place is still very quiet because it is far from the crowds. One of the most famous attractions is stone jump. It’s like piles of stones about two-meters high is where a young man dressed in customary will jump over. There are some trained people who are and always ready to show these attractions. Isolated yet worldly, the Nias Island chain has been trading with other cultures, other islands, and even mainland Asia since prehistory. Some historians and archaeologists have cited the local culture as one of the few remaining Megalithic cultures in existence today. While this point of view is hotly debated, there is no doubt that Nias’ relative geographic isolation has created a unique culture. As a culture of traders, the people of Nias find tourists to be a welcome – and historically familiar – phenomenon. 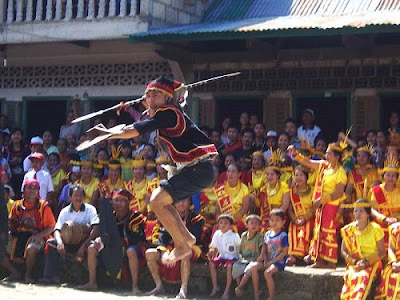 Nias best known for its remarkable diversity of festivals and celebration. The most well known events are War Dances, performed regularly for tourists, and Stone Jumping, a manhood ritual that sees young men leaping over two meter stone towers to their fate. In the past the top of the stone board is covered with spikes and sharp pointed bamboo. The music of Nias, performed mostly by women, is noted worldwide for its haunting beauty. The predominant religion is Protestant Christianity. Six out of seven Niasans are Protestant; the remainder are about evenly divided between Muslim (mostly immigrants from elsewhere in Indonesia) and Catholic. However adherence to either Christian or Muslim religions is still largely symbolic; Nias continues into current day celebrating its own indigenous culture and traditions as the primary form of spiritual expression. The people of Nias build omo sebua houses on massive ironwood pillars with towering roofs. Not only were they almost impregnable to attack in former tribal warfare, their flexible nail-less construction provide proven earthquake durability. Nias is home not only to a unique human culture but also endemic fauna which differ from other areas of North Sumatra because of the island’s remote location separate from Sumatra.